Signing day is in the rear view mirror and high school seniors across the country have largely made their decisions on where they will play college football. But what often goes unnoticed is the junior college players who also sign their letters of intent. These players already have college experience and can have an instant impact on their teams and complement current talent by adding depth. Joe Walker will be a senior leader for the Ducks in 2015. 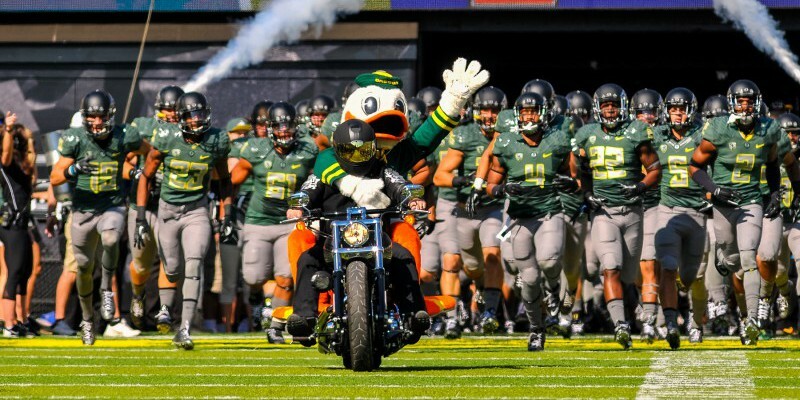 Oregon will have three senior linebackers in 2015: Joe Walker, Tyson Coleman and Rodney Hardrick. That will leave the Ducks with only Danny Mattingly, a sophomore, as the remaining linebacker with legit game experience after they graduate next year. Interestingly, the Ducks just signed two junior college players – Paris Bostick and Jonah Moi – both linebackers. Considering how often the Ducks like to rotate players on defense, we should see more of junior Johnny Ragin III and sophomores Jimmy Swain IV and Justin Hollins this season. But the newly-added junior college players could have an big impact while also adding bodies to an otherwise small linebacker rotation. Bostick originally committed to Georgia out of high school and redshirted his first season at the school in 2013. Last season he had 42 tackles while playing at Santa Monica College and earned PrepStar junior college All-American honors. Standing at 6-foot-1 and 218 pounds, the sophomore should provide good speed at the outside linebacker position while also helping to solidify the rotation for this year and beyond. His size is similar to former Duck Derrick Malone Jr., so if he can learn the system quickly, he could become a name Duck fans get used to saying for the next few years. 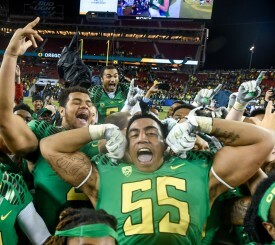 Tui Talia (55) was a junior college transfer that helped the Ducks defensive line depth last season. Moi was considered a Washington State lock until signing day when he flipped his decision to Oregon. 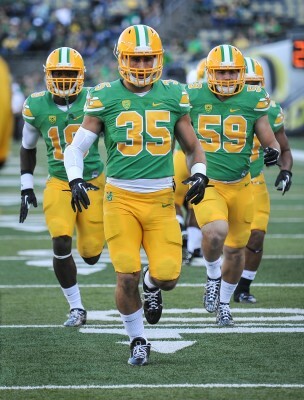 The Ducks will benefit from the 6-foot-4, 235-pound inside linebacker’s physical presence in the middle. Moi finished his sophomore season at Riverside City College with an impressive 82 stops and 10.5 tackles for loss. Moi has a nose for the ball and his numbers show he isn’t afraid to be physical – two things that will help him acclimate to the increased speed and competition of big time college football. He will be a junior next season at Oregon, but the former rugby player should be in contention for some good reps on the inside of the Duck defense. The two freshman linebackers for the Ducks last season, Swain and Hollins, are talented but unproven as they have only seen minimal game action. Watching their improvement from Year 1 to Year 2 will be something to keep an eye on as the 2015 season approaches, but having two players with starter experience coming in will only benefit the Oregon defense. Junior college players aren’t often as praised as high school recruits, but Bostick and Moi could be the quiet heroes of the defense for next year and beyond.